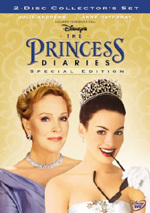 Anne Hathaway, the delightful star of The Princess Diaries, is Ella in the charming fairy tale adventure Ella Enchanted. On the day of her birth, Ella is given a gift from her Fairy Godmother - the gift of obedience, which is also a curse. Under no circumstances can Ella refuse anything she is asked to do, no matter how wicked it may be. Tired of being taken advantage of, Ella, with a talking book as her companion, leaves home to find her Fairy Godmother and return her unwanted gift. This simple errand soon turns into an amazing journey filled with ogres, giants, wicked stepsisters, elves, and the plotting of Prince Charmont's evil uncle who wants to take over the Crown and rule the kingdom. Bursting with colorful characters, music, wit, and whimsy, Ella Enchanted is a truly enchanting and heartwarming tale that will captivate the entire family. $6.169 million on 1931 screens. As both Shrek and Shrek 2 established, there’s clearly an audience for movies that spoof the conventions of fairy tales. However, it looks like the appeal of these films may limit itself to animated efforts, for 2004’s live-action Ella Enchanted failed to make any form of dent at the box office. At the start, we meet an infant named Ella of Frell. A fairy casts a spell on her, but crummy fairy godmother Lucinda (Vivica A. Fox) sticks her with the gift of obedience. We see how this “gift” affects her as she grows up and becomes a kind girl. She suffers through the premature death of her mother (Donna Dent), who gives her a special necklace on her deathbed. A few years later, her father Peter (Patrick Bergin) marries Dame Olga (Joanna Lumley), a nasty piece of work who brings along her two catty daughters Hattie (Lucy Punch) and Olive (Jennifer Higham). They lust after hunky Prince Char (Hugh Dancy), who Ella disdains for some of his uncle, Sir Edgar the surrogate king’s (Cary Elwes) segregationist policies; he separates enchanted creatures and uses them for slave labor. Her father goes on a business trip, which leaves Ella stuck with her new stepfamily. Unfortunately for Ella, the conniving Hattie soon discovers the secret of her “gift”, and she will inevitably want to use this for her own means. Soon we meet Char and the king. It seems that Char doesn’t know much about the king’s decisions, but the leader persuades him to believe he’s doing the right thing. Ella meets Char when she and her friend Areida (Parminder Nagra) protest an appearance by the royals. Ordered by Hattie to go home, she does so, and Char literally runs into her when he flees a crowd of rabid girls. They argue and sparks fly. The stepsisters come upon them, which fires anger in the jealous Hattie. She hits on Char with little success, as he prefers the more challenging and lively Ella. Hattie uses her knowledge of Ella’s “gift” to her advantage and has her shoplift, which culminates in Ella’s arrest, which she then gets forced to blame on Areida. They then force her to tell Areida never to talk to her again, which causes great sadness in her. Given the decline in her personal affairs, Ella becomes determined to find Lucinda and get her to retract the “gift”. Family household fairy Mandy (Minnie Driver) gives her a special present to aid her on her quest: her boyfriend, an enchanted book named Benny (Jimi Mistry). He shows her that Lucinda’s in Giantville, so they head out in that direction. Along the way, she rescues an elf named Slannen (Aidan McArdle), who then becomes her traveling companion. Elves aren’t allowed to be anything other than entertainers, which chafes Slannen, who wants to become a lawyer. Ella convinces him to entreat the prince for a change of policy so that he can pursue his dream. While Ella engages on her quest, a letter arrives for her that includes an invitation to Char’s coronation ball. Olga plans to send her daughters instead so Hattie can try to land the prince. Back during Ella’s journey, she and her pals encounter a group of ogres who plan to eat them. Luckily, Char and his cohorts rescue them before they lower Ella into a pot. We learn that Char blames monsters for the death of his father, King Florian. Eventually, the two get to know each other better as he accompanies her on her journey. She challenges him to question authority more often and make a difference. The rest of the movie follows the search for Lucinda, Char’s growth as a person, and the inevitable romantic developments. When I first saw the previews for Ella, I thought it looked like a tepid attempt to steal some of Shrek’s thunder. However, it received some good notices, which made me think it might have more to it. Unfortunately, it didn’t, as the result came across as warmed-over semi-spoofery. Geez, they even steal the more successful flicks’ pop-tune-performed-by-the-whole-cast gag! At essence, Ella offers a variation on the Cinderella story. It doesn’t hide those allusions, of course, such as when Hattie makes Ella steal some glass slippers. The movie never quite decides if it wants to focus on the parody side of things or the romance, which renders the result muddy. The wisecracks come across as tacked on and without bite, but the other elements fail to develop well either. Ella boasts a pretty decent cast, though I don’t know how talented I regard Hathaway to be. She’s a gorgeous young woman and clearly has skills, but she doesn’t bring much personality to Ella. Our lead should present a livelier and more engaging personality, but we never really begin to care about her. The chemistry between her and Dancy also seems thin. The other actors don’t get much chance to shine. Elwes usually works well in nasty roles like Edgar, but he feels muted here. Lumley has played similar bitchy roles many times and she does nicely in them, but she gets little to do here. Most of the actors get wasted without much substantial material behind them. That’s the film’s big flaw. At times Ella seems to desire to become a Monty Python take on things - heck, it uses Eric Idle as the narrator - or at least it aspires to a Princess Bride style. Unfortunately, it just doesn’t have what it takes. The story lacks much cleverness, and nothing about the execution brings it to life. The movie had some potential but doesn’t manage to turn into something special or particularly entertaining. 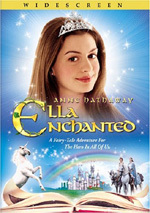 Ella Enchanted appears in an aspect ratio of approximately 1.85:1 on this single-sided, double-layered DVD; the image has been enhanced for 16X9 televisions. Though generally solid, the picture displayed some inconsistencies that rendered it occasionally unsatisfying. For the most part, sharpness looked good, but exceptions occurred. I noticed occasional wide shots that came across as a bit ill-defined. Nonetheless, the majority of the flick appeared nicely concise and accurate. I noticed no issues with jagged edges or shimmering, but some moderately prominent edge enhancement at times. That factor was the main distraction, as it made the movie a bit muddier than I’d like. As for source flaws, I saw no signs of defects, though a few compression artifacts popped up at times. The palette of Ella went for a storybook feel, as it offered a somewhat golden tint much of the time. This rendered the colors on the subdued side of things, as they went more for “stately” than for “vivid”. Overall, the tones came across as acceptably rich and full. Blacks were deep and concise, while low-light shots seemed appropriately well-developed. Too many flat shots occurred to make this a strong transfer, but it had enough positives to earn a “B”. In addition, the Dolby Digital 5.1 soundtrack of Ella Enchanted came across as good but unexceptional. Mostly that resulted from a fairly limited soundfield. I thought a fantasy romp like this would open up the spectrum neatly, but instead it maintained a pretty heavy emphasis on the forward channels. The mix spread effects and music well across that spectrum, as both provided nice delineation and localization. The surrounds kicked into effect decently at times. For example, when Ella sang at the giant wedding, the mix broadened to a good degree and used the back speakers in a fairly involving way. Nonetheless, they mostly played a moderately passive role in the flick. Audio quality was what we would expect for a modern movie. Speech seemed natural and warm, and I noticed no issues with intelligibility or edginess. Effects came across as concise and accurate, and they boasted pretty decent bass when appropriate, such as during the loud footsteps of ogres and other beasts. Music sounded clean and bright, with good reproduction of the score and songs. The mix felt too restrained to become anything special, but the audio of Ella was solid enough to merit a “B”. We also find a mix of supplements on this DVD. We begin with an audio commentary from director Tommy O’Haver and actors Anne Hathaway and Hugh Dancy. All three sit together for this running, screen-specific discussion. Don’t expect a slew of insightful details, but the program gives us a mostly engaging look at the movie. A perky affair, they go into lots of general notes about the production. We don’t hear a strong overview of things, but we learn many trivia bits that occurred. Some of this gives us a feel for how things were on the set, and despite the abundance of happy talk, we even hear the occasional mention of problems. The trio interact well and make this a bouncy and largely entertaining piece. After this we find 11 Deleted and Extended Scenes. Taken together, these run a total of 14 minutes and 57 seconds. Mostly these just expand existing themes and provide a bit more exposition, so they largely seem unnecessary. The most significant comes from additional shots at the wedding reception, as we observe the developments in the lives of more characters. We also see Lucinda’s attempts to give Ella and Char a wedding gift and what she does for Hattie. We can watch the scenes with or without commentary from O’Haver and Dancy. They provide a couple of minor notes but not much information, and we rarely learn why they omitted the sequences. Since that rationale is the main point of deleted scene commentaries, this track becomes much less useful than I’d like. Next we find a Music Video for Kari Kimmel’s “It’s Not Just Make Believe”. A cheap effort, it melds movie clips with fairytale-themed lip-synch shots of Kimmel. Prince Charmont’s Fan Club is a set-top game. It requires you to remember the squares on a grid in which pursuing girls reside; you need to plot a path without landing on those blocks. It’s moderately challenging and comes with a fun reward: a look at all the “hidden faces” in the movie. The Magical World of Ella Enchanted runs 28 minutes and 31 seconds. It presents the standard array of movie clips, behind the scenes footage and interviews. We find notes from O’Haver, Hathaway, Dancy, producer Jane Startz, president of Miramax Music Randy Spendlove, musicians Jesse McCartney, Bryan Adams, Andrea Remanda, Raven and Kari Kimmel, senior compositor Sean Farrow, animatronics and ogre suit Neal Scanlan, production designer Norman Garwood, costume designer Ruth Myers, and actors Minnie Driver, Lucy Punch, Cary Elwes, Patrick Bergin, Vivica A. Fox, Aidan McArdle, and Heidi Klum. They go over the basic story and characters, the film’s use of pop music, visual effects and makeup, the flick’s look and set design, costumes, the cast, and the director. I expected “Magical” to present a generally promotional view of the flick, and that’s mostly what I got, especially in the program’s first half. An awful lot of movie clips filled out the running time, which didn’t leave a lot of room for real information. However, it included a reasonable number of details about the production and gives us some decent notes. It remains way too fluffy, but it has some nice facts. At 23 minutes and 13 seconds, Ella Enchanted Red Carpet Premiere Special gives us another look at the flick. Hosted by young singers Kari Kimmel and Jesse McCartney, this offers the same construction as “Magical”. We get notes from O’Haver, Dancy, Hathaway, Startz, Elwes, Bergin, Spendlove, Raven, Klum, Scanlan, Myers, and McArdle. “Carpet” essentially just rehashes the content of “Magical”. It covers virtually all of the same topics and presents many of the identical soundbites. Does anything unique appear here? Yes, as we get shots from the New York premiere of the film. McCartney and Kimmel greet and chat with the flick’s major participants as they arrive; this roster includes bits with actor Parminder Nagra and author Gail Carson Levine, the only times we see them in the package. None of those moments tell us anything substantial, and “Carpet” ends up as a waste of time, especially if you’ve watched “Magical”. Finally, we get some DVD-ROM pieces. In addition to a weblink, we find “Ella Continued…”, a feature that purports to send us online to create our own storybooks. 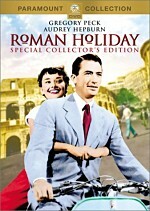 Unfortunately, as I write this a few days before the DVD hits the streets, the link just goes to the Miramax homepage. Ella Enchanted had some potential to tell an amusingly skewed fairytale, but unfortunately, it lacks the wit and charm to work. Instead, it feels uninspired and like little more than an attempt to rip off more successful predecessors. The DVD presents generally positive picture and audio plus a reasonably decent set of supplements. It’s a good DVD, but the movie itself offers only minor pleasures.